Yet according to the Panama Papers, Trukhanov is a veritable titan of business. The Panama Papers are confidential business records of the Panamanian law firm Mossack Fonseca, obtained by Süddeutsche Zeitung, a German publication, and shared with the International Consortium of Investigative Journalists (ICIJ) and Organized Crime and Corruption Reporting Project (OCCRP). The 11.5 million documents contain details of the hidden offshore empires of presidents and dictators, tax dodgers and wealthy people, civil servants and organized crime figures from around the world. The records show that Trukhanov in fact controls a substantial business empire in Ukraine through companies registered in the British Virgin Islands (BVI), a notorious offshore jurisdiction often used in Ukraine by politicians and criminals. His interests include land plots, construction of offices and apartments, and road construction projects paid for from the state budget. Overall, the database contains documents showing Trukhanov’s ownership in five BVI-registered firms. Curiously, Trukhanov lists a Moscow suburb as his place of residence, which might suggest Russian citizenship. Gennady Trukhanov unweils a World War II monument in Odesa. Kyivshliakhbud is a private company with offices located in the industrial area of Kyiv, amid many warehouses and production facilities. Throughout 2015, the Kyiv Mayor’s Office paid a total of 151 million hryvnia (US$ 9.6 million) to Kyivshliakhbud for repair of roads in the capital, despite the fact Kyivshliakhbud had been caught stealing state funds before. Back in September of 2012, the Kyiv Mayor’s Office hired Kyivshliakhbud to lay asphalt in one of the city’s residential areas. The company got the money but, according to court records from a pre-trial investigation, never did the work. Instead, it allegedly transferred the state funds to a series of intermediary companies from which the money disappeared completely. Three criminal investigations were launched, two of which have not been closed according to court records. So it was not surprising that OCCRP reporters couldn’t find the company’s office at its officially registered address. “There is no such company here,” security guards told them. The address is used by Kyivshliakhbud in all documents, including the state register and tender documentation. Calling the road-repair contractor’s phone number didn’t work either. But Kyivshliakhbud is actually connected to Odesa’s mayor through a complex set of relationships. Kyivshliakhbud was founded by a BVI-registered company, Sawyer and Branton Ltd. The Ukrainian company registry lists this offshore as a majority shareholder of the Odesa-based Rost Investment Group Ltd. Trukhanov’s daughter, Kateryna, was listed as the director of SKVO LLC, one of the companies in the Rost group, until May 12. SKVO’s founder, Andriy Ivancho, shows up as a shareholder along with Trukhanov in a number of BVI companies found in the Panama Papers. According to Ukraine’s court records, SKVO is one of the companies that is being investigated for allegedly siphoning the money Kyivshliakhbud received from the 2012 state procurement deal. The tallest building in Odesa. Kyivshliakhbud’s chief executive officer is Oleksandr Rashchupkin, who also heads Panteon-Yuh LLC, registered in Odesa at 1a Henuezka St. That’s the location of Ark-Palace, one of the most expensive apartment and office buildings in the city, which can be seen from almost any place in Odesa. One of its towers, a 24-story edifice of 106 meters, is the tallest building in Odesa. An average apartment of 180 square meters here goes for about US$ 750,000. Some apartments sell for as much as US$ 3.5 million. This real estate complex was built by the Rost Investment Group. Many companies associated with Trukhanov are registered at Ark-Palace, 1a Henuezka, and some own space in the building. For instance, Vynni Tradytsiyi LLC (Wine Traditions), a company registered as a wine producer and leaser of real estate, owns almost 350 square meters of basement space in the building. OCCRP partners in Russia visited the address. 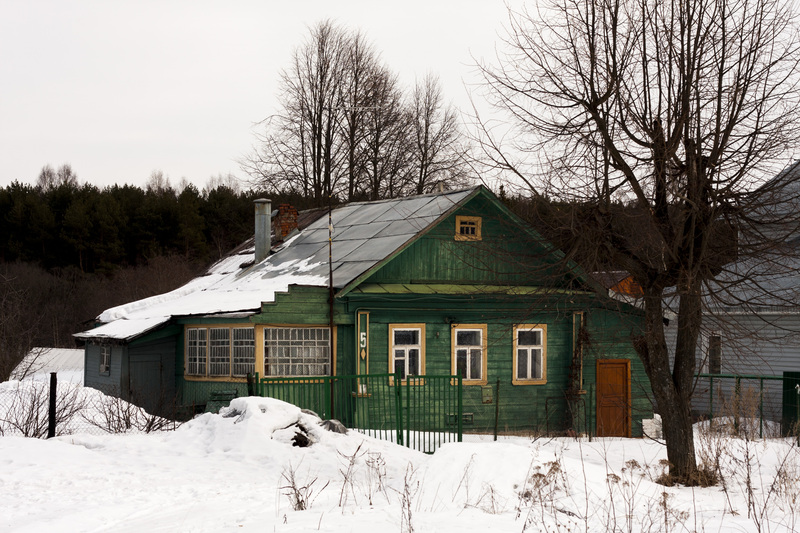 The building where Trukhanov is registered is an old, private house with a wooden facade painted green. It seems unlikely that a businessman who, together with his partners, owns a network of companies linked to BVI offshores has ever lived here. Apparently, Trukhanov uses this old house as a formal Russian address. In 2014, Volodymyr Ariev, a Ukrainian Member of Parliament, published records from Russia’s migration authorities showing that Trukhanov held a Russian passport. The documents showed that on March 24, 2011, Trukhanov obtained a replacement passport required at the age of 45 from the Sergiev Posad branch office (the same town as his address of convenience listed in the Panama Papers). Trukhanov denies he is a Russian citizen, calling it a provocation by political opponents. However, when OCCRP asked for a comment on the issue, Trukhanov refused to answer directly. “He has denied it so many times already that he does not see any point in doing that again,” said his press secretary, Natalia Maltseva. On April 27, three weeks after the local version of this story was broadcast in Ukraine, Trukhanov responded to a Slidtsvo.info reporter at a press conference in Odesa. He promised to publish all the documents he requested from the Russian consulate general “with all the explanations” “today or tomorrow.” On May 18, Trukhanov published on Facebook a letter dated April 14 from the Russian Consulate in Odesa stating that he “has not acquired Russian citizenship” and “is not a Russian citizen.” OCCRP could not verify this information. Reporter: Hello, is this Kyivshliakhbud? Reporter: Where are you located? Woman: In Kyiv, at Naberezhno-Korchuvatska street …. Reporter: We have just come back from the place, nobody has seen you there. Woman: Well, our subsidiary is located there… But we are actually located in Odesa. Reporter: … So are you an Odesa company? Reporter: May I speak to (chief executive officer) Rashchupkin then? Woman: What do you want to inquire about? Woman: I will transfer you to a lawyer. Lawyer: And who are you? A journalist? No, we do not want to respond to surveys. It's not unusual to see the Mayor of Odesa posing in military outfit around the Victory Day on May 9. Another business that can be traced back to Trukhanov with the help of Panama Papers is a picturesque housing development called Ariadna, near Odesa in Chornomorske village. The name comes from a character in Greek mythology, Ariadne, associated with mazes and labyrinths. The price for a small European-style house in Ariadna costs as much as US$ 500,000. The project’s owner is Sofor, a Ukrainian limited liability company. Likewise, this company is listed in court records as one of the intermediaries that participated in the money laundering in the 2012 road repair scandal in Kyiv. But this construction company was not always called Sofor. In the late 1990s, it was called Capitan and Co. and was a security agency founded by Trukhanov and Ivancho. Today, the company is partially owned by Yuriy Shumakher, Trukhanov’s close ally and minority shareholder of the Rost Investment Group. Shumakher is a member of the Odesa City Council from Trukhanov’s Doviriay Delam (Trust the Deeds) party. In 2008 Macon Assets Ltd. (BVI), owned by Trukhanov and Ivancho, joined Yuriy Shumakher as co-owners of another BV-company, Corderoy Trading Ltd.
On the outskirts of Kyiv, an ugly concrete building stands in the middle of a beautiful evergreen park. The park was once a military health resort and the property of the General Directorate of Intelligence of the Ministry of Defense of Ukraine. One morning in 2008, residents of the neighboring buildings saw that the tall pines that had been standing there the evening before were now lying on the ground, recalls Liudmyla Motovylovets, a local resident. The former resort had been handed over to Global Invest LLC, which constructed the concrete building and, according to its agreement with the ministry, provided 17 percent of the apartments to the military intelligence agency. Since 2003 Trukhanov has been heading Ukrainian Thai Boxing Federation. Global Invest is associated with Trukhanov, too. When Global Invest first obtained the land in November of 2004, its founding shareholders were Odesa residents Larysa Streletska and Vadym Reznik, who appear in a number of companies with some of Trukhanov’s business partners. 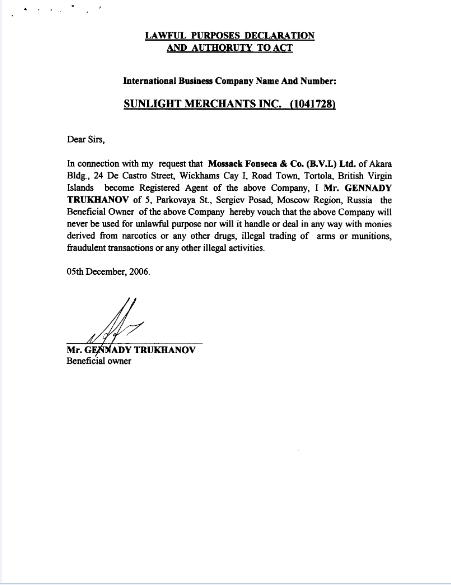 Later, a BVI-registered company called Sunlight Merchants Inc., owned by Trukhanov and Ivancho, became the company shareholder. In 2015, Trukhanov and his friends sold this construction project to wealthy Kyiv businessman Vasyl Khmelnytskyi. But the funds from this deal are not listed in Trukhanov’s asset declaration. Nor are the profits from the many subcontracts for repairs and construction of roads around the country, which all together account for more than Hr 2 billion (US$ 79 million at current exchange rates). Arkadiy Topov, an Odesa-based activist from the Anticorruption Office Initiative, analyzed the road construction deals connected to Trukhanov and says that eight out of 10 tenders worth more than Hr 20 million (nearly US$ 800,000) are won by companies that are part of the Rost group. “The small (tenders) simply do not interest them,” he adds. Nevertheless, Trukhanov insists that information about his businesses is just intrigues of his political opponents. “When I started my political career in 2005, someone warned me: you have to be ready that tomorrow they will call you an agent. Next day they will call you gay. Then they will say you have a million children apparently… So I even stopped reading about this,” Trukhanov said. Trukhanov came to politics from the martial arts: from 2003 until now, he has been the President of Ukrainian National Thai Boxing Federation of Muay Thai. Together with his friends, Trukhanov created a security agency called Capitan & Co. According to a report on Ukrainian organized crime by Italian police, mobster Leonid Minin, one of Odesa’s most influential people at that time, became Trukhanov’s client. Minin was reportedly one of the prototypes for Nicolas Cage’s character in the Hollywood movie, Lord of War. After the USSR collapsed, Ukraine started selling its abundant armaments. Ukrainian tanks, armored cars, grenade launchers, and machine guns were loaded onto ships in Odesa and delivered to hot spots all around the globe. The business was controlled by Minin. According to the Italian report, Trukhanov, using a Greek passport in the name of Gennidas Ouzopoulus, was Minin’s bodyguard. According to a 2006 report by Amnesty International, in June 2001 Minin, an Israeli national born in Ukraine, was arrested and charged with arms trafficking and illegal possession of diamonds by Italian authorities. In December 2002, the judges declared Minin non-prosecutable for international arms trafficking because the court lacked jurisdiction but they upheld the charge for illegal possession of diamonds, for which he was later convicted and fined € 40,000 (US$ 41,200). As for the allegations that Trukhanov was Minin’s bodyguard, Trukhanov is unequivocal. “Everyone classifies me as a bodyguard, I guess they think I am not good for anything beyond that,” he said.